The light weight battery powered framing nailer BF33-2-U from Bostitch uses the very latest technology to ensure high performance. 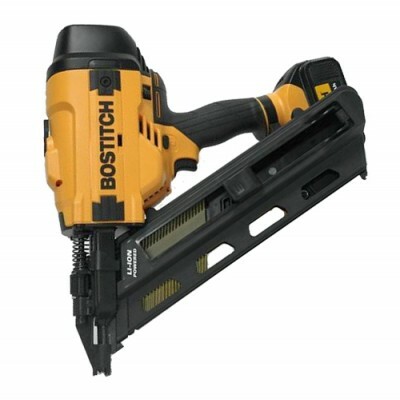 The cordless stick nailer has a brushless motor for improved power and reliability. Thanks to the no-memory high capacity Li-Ion 4.0 AH battery (no self-discharge), this tool has a maximum productivity and less downtime. Fires the more robust Wire-Weld stick nails 33° or the standard Paper-Tape nails 33° from 50 mm upto 90 mm in length. Stick nail type type WW28 with smooth shaft ** REPLACEMENT FOR PAPER TAPE! These sticknails ha.. Stick nail type type PT28 with ringed shaft ** REPLACEMENT FOR PAPER TAPE! These sticknails ha.. Stick nail type type WW31 with ringed shaft ** REPLACEMENT FOR PAPER TAPE! These sticknails ha.. Stick Nail type type PT31 with a plain shaft ** REPLACEMENT FOR PAPER TAPE! These sticknails h..
Galvanized Stick nail type type PT31 with smooth shaft ** REPLACEMENT FOR PAPER TAPE! These st..
Galvanized Stick nail type type PT31 with ringed shaft ** REPLACEMENT FOR PAPER TAPE! These st..